Welcome to San Diego! We want to make sure you have a great vacation in San Diego. 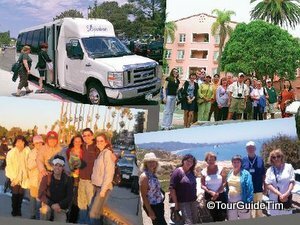 Join us for an award winning sightseeing tour or use our TourGuideTim.com travel guide to design your own adventure of things to do in San Diego. You are going to find San Diego offers much more than you ever expected. San Diego is so full of natural beauty from the ocean to the mountains and desert that our tour guests from the French Riviera and Greek Islands say this area is more beautiful than their own. Creative people and wealthy patrons have been attracted to San Diego’s beauty since its founding as the oldest place on the West Coast of the United States and together they’ve created a fascinating history of American innovation that started right here in San Diego. Combined with the best weather in the country, San Diego offers an endless array of things to do, places to enjoy, and history. Learn more about our tours, guide and tips. Unlike other bus tours in San Diego, our sightseeing tours provide both a driver and an expert guide. Our tour guides give you 100% of their attention so you get more stories and a more interactive experience. We also make good use of our time by having the driver drop-us off for guided walks so we can take a closer look where the sea lions play on the rocks, walk up to the edge of ocean cliffs, and even introduce you to the locals. Meanwhile, if anyone in your tour group has a hard time walking, they can stay with the driver in the comfort of the bus and be driven along the same area. We offer both public and private tours. Learn more about our San Diego tours. Rather than being a superficial web site that gives just a brief summary of the area’s most well known attractions, we provide in-depth detail on a wide variety of attractions, many of which would be major attractions if located in other cities but are instead hidden under the shadow of the more well known San Diego attractions like the San Diego Zoo. We provide tips on how to make the most of your visit to each of the attractions, where they are located relative to the other attractions in San Diego and how to reach them by transit or by car, and try to organize them in a way so that you don’t miss out on finding any attractions that suit your particular interests. 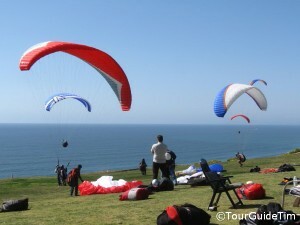 Learn more about things to do in San Diego. Planning for the Weather: No matter what time of year you vacation in San Diego be sure to bring a light jacket or sweater and bring shorts. During our summer months, we have warm days but cool evenings, especially if you are near the ocean. Those cool evenings can feel brisk if you are visiting from someplace that is typically hot and humid all summer. And during our winter months, we can have days that reach 80 degrees Fahrenheit (27 degrees Celsius). In fact, our winter months are the sunniest months of the year along the San Diego coast. 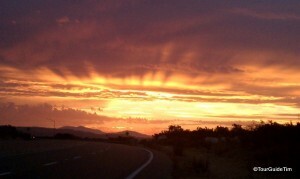 Learn more about San Diego weather. How to get around San Diego: Deciding whether you need to rent a car for your visit to San Diego? 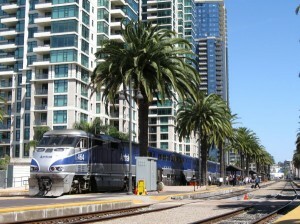 If you are planning to visit attractions in and around downtown San Diego, including SeaWorld, San Diego Zoo, Balboa Park, Old Town, Coronado, and the Gaslamp Quarter, all of these attractions can be readily accessed by public transit assuming the hotel or place you are staying is close to a bus or trolley stop. Tour guests comment on how easy it is to use our transit system, how clean it is, and the low cost for a one-day or multi-day pass that works on both buses and trolleys. However, if you are going to visit attractions further away from downtown San Diego such as the Safari Park or Legoland or if you want to visit our local mountains or desert, we recommend a car rental. Learn more about transit in San Diego. How to make time for all the things to do: Our final tip for now is to plan ahead. Unlike most cities where there may be a few concentrated tourist areas and it’s easy to find things as you go, San Diego offers hundreds of attractions and guests tell us they are overwhelmed and certainly didn’t plan enough time once they find how much there is to do in San Diego. Many guests visit San Diego as part of an extended trip that includes San Francisco and Los Angeles. They often plan fewer days in San Diego because they assume it is the smallest city with the least to offer only to say they wished they had planned more days in San Diego because it offers more things to do in a much more relaxing environment. By planning ahead you can also get discounts for various attractions. For example you can save a lot of money at SeaWorld if you buy your tickets in advance online, at a visitor center or through your hotel. Another reason to plan ahead is that some attractions close early or get sold out since San Diego is a big destination for major conventions and big companies bringing in employees from around the world for special events in beautiful, sunny San Diego. Use TourGuideTim for a great adventure! Find ideas of things to do and useful travel tips for San Diego as you look around our San Diego travel guide on TourGuideTim.com and join us for a sightseeing tour to get a more in-depth view of San Diego and its rich history. Come find out why this area attracts so many American pioneers, Nobel Laureates, authors, billionaires and Hollywood legends to live, work, and play in San Diego by joining us for a Coastal San Diego Tour to La Jolla and Torrey Pines.